Design your room, office, apartment or house, plan gardens, and more Room Arranger is 3D room / apartment / floor planner with simple user interface. Once you get the basics, you can draw whatever you imagine. While having wide library of objects, you can easily create your own piece of furniture. 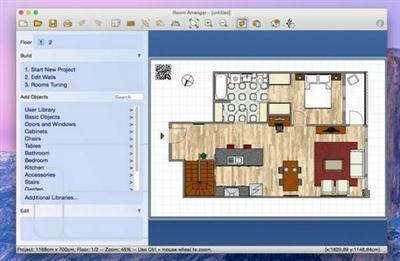 Room Arranger is 3D room / apartment / floor planner with simple user interface. Once you get the basics, you can draw whatever you imagine. While having wide library of objects, you can easily create your own piece of furniture. Room Arranger can show your project in 3D. It uses VRML standard for it. So you can put interactive 3D scene on your web.